So long, January! Spring is almost in sight and to follow on from my rainbow style edit introducing colour to your wardrobe, I’m sharing some fresh and colourful dishes to brighten up your plate. With 2.5 vegetarians in the family (the half being the mini one who will occasionally eat a ham sandwich at a party!) I’m often asked what I cook at home for the girls without meat as an option. 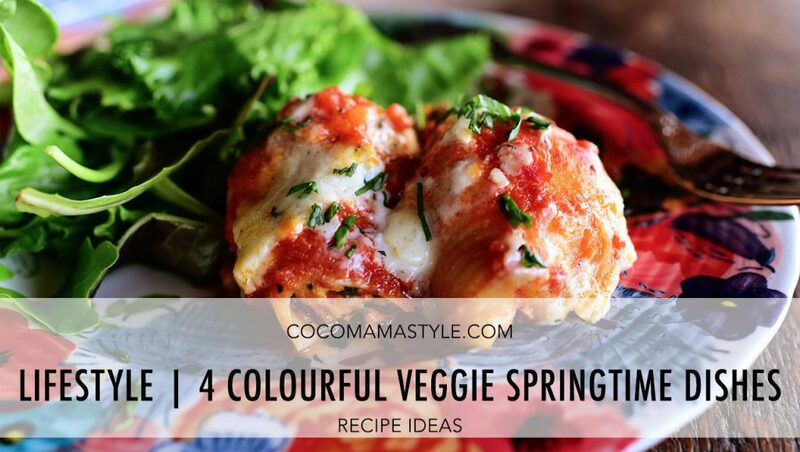 My girls both love their vegetables so it’s trying to get the protein in which is the challenge, with that in mind here are four must-try veggie meals to put a spring into your step and colour on your family’s plates. Is there anything more divine than grilled cheese? We think not; it is always a hit in our dining room and spring is the perfect time of year to enjoy some halloumi alongside an array of healthy salad recipes. Combine a bed of fresh spinach with diced cherry tomatoes, cooked barley and a handful of toasted sliced almonds (or cashews which my girls love) to give it some crunch. Cut the halloumi into chunks and grill both the cheese and some whole cherries. Grilling brings out the sweetness in the cherries and will make for the perfect balance in a savoury dish. Pair with a fresh baguette and you’ve got a tasty meal that’s filling for the whole family. 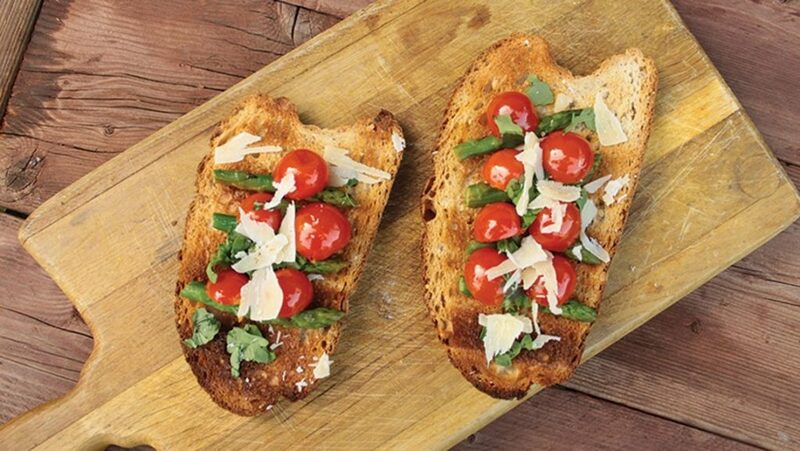 This is a great lunchtime dish if you’ve little ones at home or for everyone at the weekend and uses both fresh and colourful ingredients, with a simple topping of chopped tomatoes and grilled asparagus. Slice your baguette into four pieces and fry them in shallow olive oil till they are nice and crispy. As you’re doing this you can prepare the tomatoes, cook the asparagus and chop up a load of basil to throw in (or get your mini one to help you by tearing the basil). Mix them all together, add olive oil, salt and pepper and get ready to load up your bread with this colourful creation. Veggie burgers always go down well in our house yet I’m trying to move away from ready-made ones, and anything that the girls can get involved with in the kitchen is a winner with them. To make chickpea burgers we use grated carrots, garlic, chickpeas, egg and flour and pop into our mini food processor to make a mix thats not too sticky but holds together well to form into patties. Then heat oil in a frying pan and cook each patty until golden brown. This chickpea burger recipe is similar and super easy. To go with them cook some McCain Home Chips, because it’s OK to take the easy option sometimes! These have always been my favourites – crunchy on the outside and fluffy in the middle – a perfect accompaniment on a busy day. I’m pretty sure pasta is a go-to for every parent, any time of the year. This spring recipe is filling and warm on a cool day but also light enough to be a lunch or a side dish if you’ve got friends and their little ones round at the weekend. Buy some large pasta shells and cook them al dente. In a large pan, cook your garlic, butter, onion and spinach. Then in a smaller bowl mix up a packet of ricotta cheese, an egg and freshly diced basil and parsley. These two dishes will be combined to create the filling for your shells. 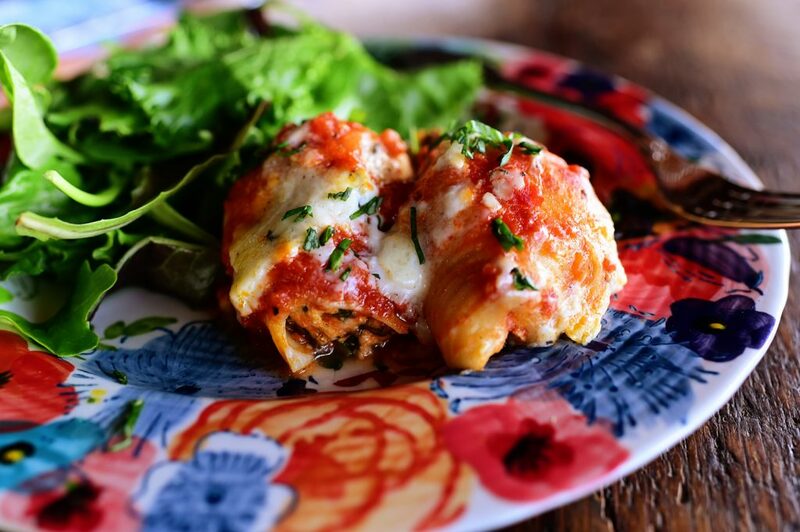 Once the pasta is cooked you can start stuffing each shell – if you allow the shells and cooked mix to cool a little first, the children can help you fill the shells. Lay them into a casserole dish with the open side down then on top of the shells you can pour a white or red pasta sauce, or both if you fancy. As I have one child who likes white sauce and one who likes red, I have to serve separate dishes of each! These four colourful dishes are sure to get the whole family in the spring-time spirit. What will be on your family’s plates this season?